It feels like it should be Friday already! #amiright I have been working on our bathrooms (finally) and am dying over everything I found on pinterest and the prints I found on etsy! I love the idea of black and white so clean and open. We have the best lighting that comes through our windows and in the master bathroom ... it's perfect in the morning! If we weren't renting I would definitely paint the cabinets a beach/ocean blue color and stick to the black and white! The get naked print is a MUST! It shows personality and its the perfect print for any bathroom! Our master bath, I put glass jars filled with soaps, cotton balls (the usual) to bounce the light and keep the space looking fresh, clean and airy! I would love to put the removable wallpaper in the toilet room (is that what you call it?!?!) It's a black and white palm leaf print which is PERFECT! 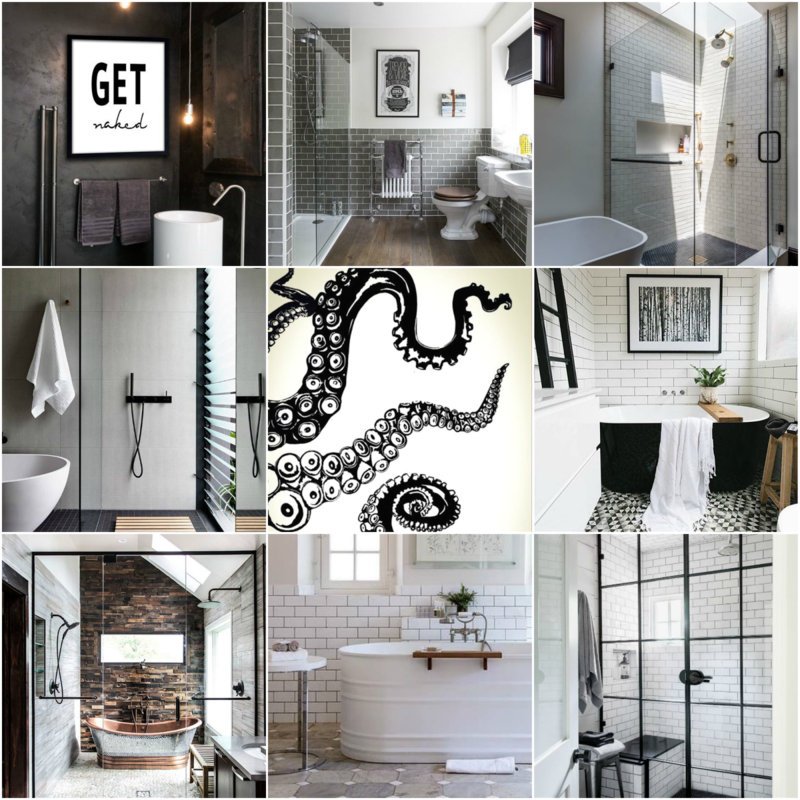 The octopus print would be perfect above the toilet. A few wall hooks (loving these and these) for robes and towels. Always a touch of beach anything! Our room with the toilet is just enough space to get whatever job done :) you need to so I have been looking for a round rug for your toes, and maybe a few small tropical black and white prints and that little space would be perfect! Oh and I do like the idea of a hanging light, like this one from Potterybarn.